Jessica Harper (PHANTOM OF THE PARADISE, PENNIES FROM HEAVEN) stars in this horrific tale of a young student who uncovers dark and horrific secrets within the walls of a famous German dance academy. 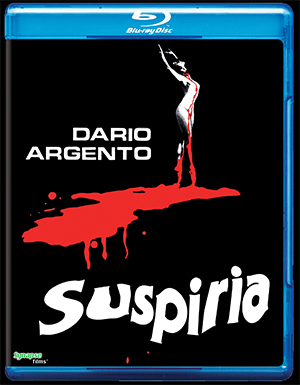 Dario Argento's SUSPIRIA comes to home video from Synapse Films in an exclusive new 4K restoration from the original uncut, uncensored 35mm Italian camera negative with the original 4.0 English surround sound mix, for the first time EVER! Painstakingly restored over the past three years, Synapse Films has created the ultimate special edition of this horror classic with the supervision and approval of the film's Director of Photography, Luciano Tovoli. 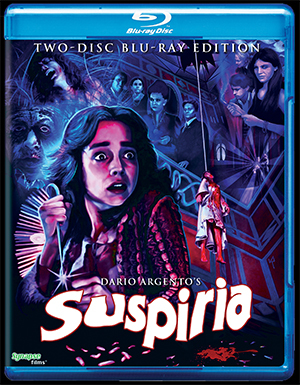 - A new 4K restoration of the original uncut, uncensored Italian 35mm camera negative exclusively done by Synapse Films, with color correction supervised and approved by SUSPIRIA Director of Photography, Luciano Tovoli. - Original 4.0 1977 English language LCRS sound mix not heard since the theatrical release in 1977, presented in high-resolution DTS-HD MA 96kHz/24-bit audio, with newly-translated removable English SDH subtitles. - Italian 5.1 surround mix, with removable English subtitle translation. - Do You Know Anything About Witches? - 30 minute SUSPIRIA visual essay written, edited and narrated by Michael Mackenzie. - Suzy in Nazi Germany - Featurette on the German locations from SUSPIRIA. - A Sigh from the Depths: 40 Years of SUSPIRIA - All-new anniversary retrospective on the making of the film and its influence on cinema. - Olga's Story - Interview with star Barbara Magnolfi. - Original theatrical trailers, TV spots and radio spots. - "International Classics" English "Breathing Letters" opening credit sequence from U.S. release. - Alternate All-English opening and closing credits sequences, playable via seamless branching. - Reversible Cover Art created by Joel Robinson. - Two audio commentaries by authors and Argento scholars, Derek Botelho, David Del Valle and Troy Howarth.